The grey text menu at the top left of the interface links you to all the functions, screens, tools and settings in the software via a series of drop down lists. A summary of each menu is outlined below but the best way to learn about them is to open up the software and have a look through the menus yourself. The left section of the screen displays a collection of panels, each one containing content that can be inserted onto the pages of your project, thus we call them the Content Panels. Not only can you access your own photos in the Photos Panel but there are four other panels storing hundreds of professionally designed graphics and decorations. Each panel is accessed by clicking the related icon in the orange bar at the top of the Content Panel, then you can use the buttons unique to each panel to locate and select the content. To add any content (photos, backgrounds, frames, embellishments or layouts) to your project you simply drag the item from the Content Panel to the Work Area in Sort View, Layout View or Cover View. There are six different Views in the software that guide you step-by-step through the creation process. We call them Views because each of them gives you a different view on your design and in the Work Area. You can move between the different Views by clicking on the icons in the orange bar above the Work Area. 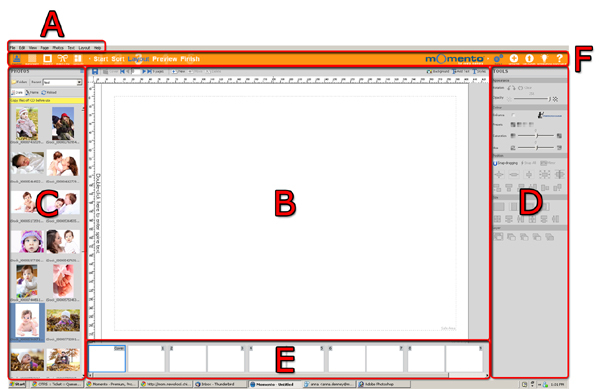 The Work Area is the area directly below the Software Views menu in the centre of the interface. The Work Area looks different according to which View you are in. The Work Area in Layout View and Cover View is an almost full-screen presentation of your page design and all its contents in graphical form. The Work Area in Sort View however presents a list of your content represented as icons. To add any content to your project in Sort View, Layout View or Cover View, simply drag the item from the Contents Panel on to the Work Area. Just as the Contents Panel on the left side of the interface includes a number of interchangeable panels so does the Tools & Services Panel on the right side of the interface. The Tools and Services Panel links you to editing tools, more downloadable Momento content plus onscreen help and inspiration for designing your projects. For more information please see Tools, Updater and Quick Help.